These Father's Day coupons can be given to dad on this special day, and he can redeem them throughout the year for everything from being relieved from trash duty to getting to pick where he wants to go to lunch. Giving a Father's Day coupon book is a great gift because you can personalize it just for dad with coupons that he'll especially like. They're also all free and can be printed right from your own home, making it a very quick and easy gift. You might also like these printable Father's Day cards and coloring pages all about dad. 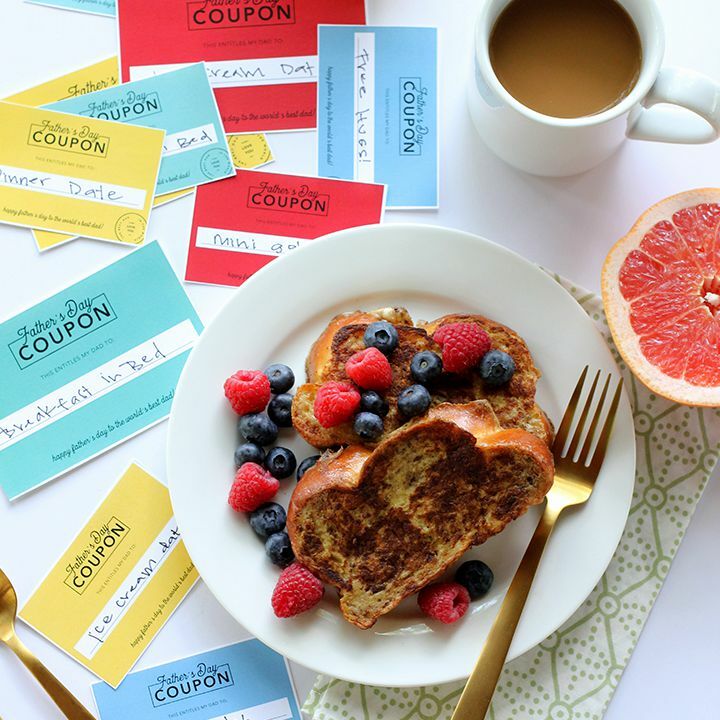 These colorful Father's Day coupons are all left blank so you can fill them in with what your dad really wants. There are lots of ideas here though in case you get stuck. There are two size options available, the smaller one fits 8 coupons per page, and the larger one fits 4 coupons per page. These green, gray, and cream Father's Day coupons that will give dad everything he wants for Father's Day this year. Detailed instructions tell you how to cut the coupons and assemble them into a coupon book. Note: You do have to subscribe to A Whole Lot of Tiny's newsletter to get these Father's Day coupons, but it's completely free to do so. Skip To My Lou has a complete free Father's Day coupon book that includes the filled in coupons and the coupon book. It only takes a fold and a staple to put it all together. There are two pages of coupons for things like a car wash, breakfast in bed, a big hug, movie night, and more. Dad will love these Father's Day coupons that are shaped like ties. There are 10 different designs, the front with a design and the back that has room for the coupon. The coupons are all left blank, so you'll have to come up with your own ideas on what dad would like best. Redfly Creations has created these very manly Father's Day coupons that can be printed all for free. There are eight different designs that include coupons like a back rub, bear hug, and ice cream, along with some blank coupons so you can write your own. These free Father's Day coupons have a great homemade look to them and are in some really fun colors. All the work is done for you and you'll just need to print out the coupons that dad can redeem to get free hugs, a movie night, breakfast in bed, ice cream, pizza, car wash and day free of whining. Here's a spin on Father's Day coupons - tokens. Dad can use the tokens to get a free car wash, game of catch, a chore done, bear hug, and a break from trash duty. You can use the blank token to create a special one just for your dad. You can download these tokens in four different colors before printing - green, orange, red, and royal blue. These "Dad Tickets" are adorable and include even a faux bar code that's needed for authenticity. You can print out the coupons and then write in what the ticket can be redeemed for. There's also a cover you can print out and use to make a coupon book with. Here's another blank Father's Day coupon that also comes with a printable cover so you can put it together as a book. There is a lot of writing space on these coupons, making it super easy for kids to write out their coupon. This printable coupon book has a few blank coupons as well as coupons that dad can redeem for a car wash, dad time, the biggest bear hug ever, taking out the trash, and folding a load of laundry. A printable coupon book cover is included, making this quick and easy Father's Day gift. This colorful Father's Day coupon book includes a printable cover and coupons that can be filled in with a special favor that dad can get. This coupon book would be a great present from all the kids because each kid can sign their name to particular coupons. You have your choice of printing pre-written or blank Father's Day coupons over at Itsy Bitsy Fun. The pre-written coupons include obeying with no whiting, quiet time during TV, breakfast in bed, taking out the trash, and more. These Father's Day coupons are for mom to give to dad for his special day. Mom slips these coupons in his wallet, and ad can redeem them for a movie night, game night, lunch out, and more.